Conditions at the inlet have been ideal, great fishing, great weather and this week. For the latest on what’s biting, what lures and bait are doing the trick and prime spots, go see Tommy and Sara at Sebastian Inlet Bait & Tackle, or call (321) 768-6621 – anglers have a ton of options this time of year. We’ve seen a great number of folks after Flounder and Sheepshead just West of the bridge, and there’s been some great action on the South Jetty for those of you who want an alternative to the North Jetty. We’ve got Reds, Black Drum, Snooks, Spanish Mackerel, Bluefish, and more. A shout out to angler of the week this week – Steve Eckelman! Thanks for sending in your pic. 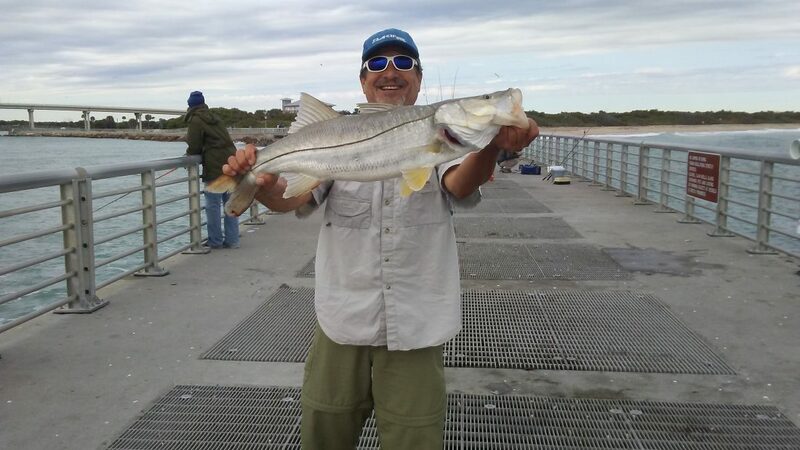 Steve caught this 31” Snook after catching and releasing 7 or 8 over the last four trips to the North Jetty. Keep at it and you’ll be rewarded!